So that’s what bond investors think of Finance Minister Tito Mboweni’s maiden budget. 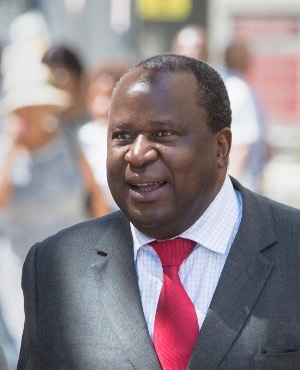 In the first scheduled bond auction since Mboweni delivered his fiscal update to members of parliament on October 24, demand dropped 67% from the previous sale to the lowest since March, when the amount offered was reduced to R2.4bn a week, according to data compiled by Bloomberg. Primary dealers that buy bonds directly from the government on Tuesday placed R4.17bn of orders, well below the R7.4bn average over the past eight months, National Treasury data shows. Mboweni revised growth and tax revenue forecasts lower, while targeting a wider budget deficit and higher government debt over the next three years than previously predicted. The budget was credit-negative, according to Moody’s Investors Service, the only major rating company that still ranks South Africa’s debt at investment level. The "uninspiring" auction showed investors are betting benchmark yields are still too tight, even after they climbed to the highest level this year, said Deon Kohlmeyer, a fixed-income trader at FirstRand [JSE: FSR] in Johannesburg. "The budget was not great for bonds." Yields on benchmark 2026 government bonds rose five basis points to 9.29% by 15:00 in Johannesburg. South African government rand bonds have lost 11% for dollar investors this year amid a record sell-off by foreign investors.